These charts created by Harry Rice in 1960 have been donated to the HBA by Dan Gleeson and displayed here with the kind permission of Betty Williams. Dan Gleeson gave these charts to the HBA in August 2008. He was to attend the HBA AGM in November 2008 for a formal handing-over ceremony. Tragically, he drowned in Shannon Harbour in the week before the AGM. The HBA acknowledges his generosity and is committed to continuing one of Dan's favourite projects: raising funds for the Nenagh Canoe Club. The seven charts are almost A3 size. They cover the stretch of water from Lough Key to Lanesborough, but provide considerably more detail than the sketch-maps in *Thanks for the Memory*. 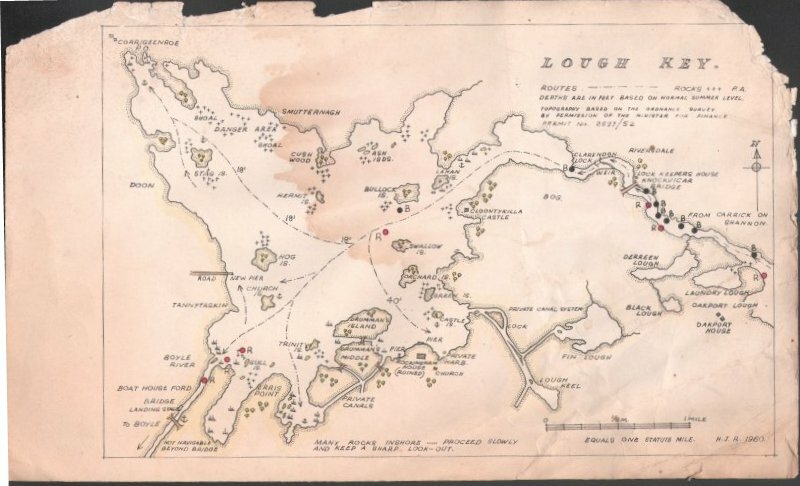 Here, for instance, the chart shows anchorages, shoals and more courses, as well as extra detail on the private canal system. B.J.Goggin.